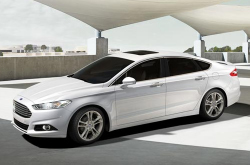 Like its smaller sibling, the Focus, the Ford Fusion is one safe car. It earned an IIHS Top Safety Pick + rating thanks to its high scores in front, side, roof and head restraint tests. The Insurance Institute for Highway Safety isn't the only organization honoring this capable mid-size sedan; the NHTSA gave it a top vehicle safety rating of five stars under their New Car Assessment Program guidelines. What that means to you is this: Driving a 2013 Ford Fusion in Dallas and the metro area makes for a safe trip. And if the worst happens, you're equipped with the latest technologies and safety features designed to protect you and your family. Since driver safety is one of the key factors in the redesigned Fusion, it'll come as no surprise to you that Ford engineers added a wealth of new safety features and continued to improve existing equipment. For instance, the overall body strength of the Fusion was increased by 10 percent through the use of high-strength steel and other materials. A brand-new airbag system was devised to provide 360-degree protection that actually conforms to a person's particular size and position in the seat to provide greater protection in the event of a collision. Tack on other driver-assist safety technologies like Lane Keeping Assist, adaptive cruise control, a rearview camera and forward collision warning, and you've got the safety profile of the new Ford Fusion. To learn other interesting facts, including convenience features, engine options, mpg ratings and more, continue reading the Ford Fusion review below. Check out the 2013 Ford Fusion to versus similar autos like the 2013 Kia Optima, Toyota Camry, Subaru Legacy, Hyundai Sonata and the Chevrolet Impala, and you will find that the 2013 Fusion trumps those vehicles in oodles areas. Scan the reasons see why! Get reliable factory parts and exceptional workmanship from Ford technicians at a site that's just a small journey from your pad. At our Ford auto repair center in Grapevine, we offer this and a year warranty on all work! When you bring your Fusion to our auto repair department in Grapevine, you'll get dependable service from our friendly mechanics. Our techs can take care of a large spectrum of jobs - from challenging stuff like Ford electronics repair to less intricate duties like fuel filter and timing belt replacement. Grapevine Ford is your best choice in Grapevine for quick, professional Ford service and regularly scheduled maintenance. Check out our service specials by clicking on the link below. 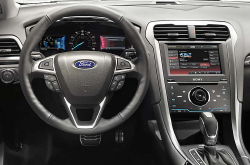 If the redesigned 2013 Ford Fusion's healthy mix of new looks, powertrains, safety features and amenities doesn't get your motor running (sorry, please excuse the pun), then we're not sure what will! Visit Grapevine Ford today and you can drive one home! For years Ford Fusion shoppers in Dallas and the surrounding metro area have known our low prices and affordable financing packages are among the best in Texas. If you haven't taken the time to visit us yet, contact us today. Fill out the form on the upper right-hand side of this page and one of our GVF reps will contact you immediately to answer questions or set you up for a test drive. Search online for your 2013 Ford Fusion today!